As a recent report reveals, when it comes to funding India’s armed forces, the government seems less than patriotic. When Narendra Modi became Prime Minister, there were expectations that the country’s military profile would increase sharply. The government went out of its way to valourise the soldiers and wrap the tricolour around itself. But as a recent report of the Parliamentary Standing Committee of the ministry of defence has revealed, when it came to putting out money to fund India’s military, the government seems less than patriotic. The committee, which is headed by a senior BJP MP, Maj Gen (retd) BC Khanduri, came to the conclusion that 68 per cent of the Army equipment was obsolete. Just 24 per cent was of the current category and 8 per cent state of the art. Army vice-chief Lt Gen Sarath Chand explained to the committee that “allocation of insufficient funds to meet liabilities of routine maintenance, making up deficiencies, emergency procurements… will definitely have a negative effect. This shall also affect the serviceability of the equipment we are holding besides leading to legal issues of not making payments on time.” One area directly affected is the security of military facilities that has become so important after the attacks on Uri, Nagrota and Sunjuwan. You would be mislead if you went just by the fact that the allocation for defence is a massive Rs 2,79,305crore in the coming financial year, along with an additional Rs 1,08,853crore for pensions. This is because we have one of the largest militaries in the world and a great deal of the money is spent on pay and allowances of the personnel and maintaining the existing equipment and infrastructure. The real story comes from the fact that where the three Services projected Rs 1,72, 203 for capital expenditure for the purchase of new equipment, they were only allotted Rs 93, 982crore. This is not even sufficient to meet the “committed liabilities”, viz the payment installments for the equipment already purchased, estimated to be of the order of Rs 1,10,043crore. In other words, leave alone new equipment, the services are not even in a position to meet the payment obligations of the equipment on order. The one area that the Army has been desperately trying to make up is that of immediate stocks of ammunition and spares to fight a 40-day war, which could see 10 days of intense fighting. The government permitted the Army to acquire the materials and contracts worth Rs 2,246crore and further agreements worth Rs 9,980crore have been negotiated. 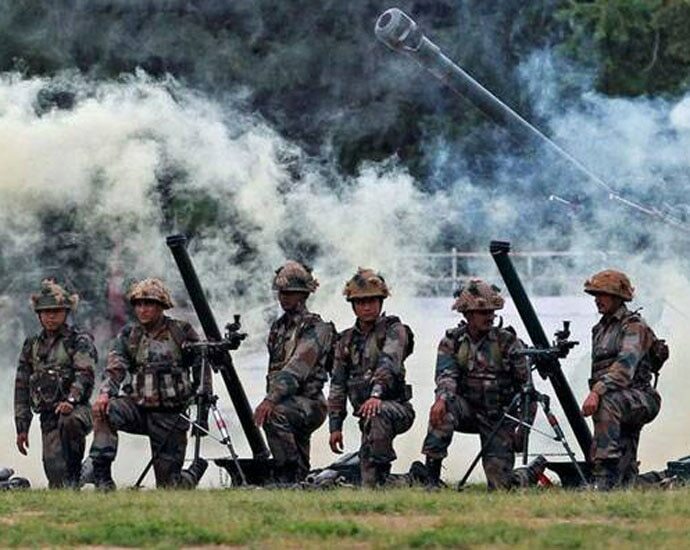 To make up for the shortfall the Army would require Rs 6,380crore, but they have been allotted only Rs 3,600crore. This means that the country cannot fight even a short war at present. At the larger level another pernicious consequence of our dysfunctional defence system is that it is dependent on imports to sustain itself. The latest report of the Stockholm Peace Research Institute (SIPRI) shows that India has been the largest importer of major arms in the world in the 2013-2017 period; it accounted for 12 per cent of the global total and its imports increased 24 per cent between 2008-2012 to 2013-2017. No country can become a significant military power unless it designs, develops and manufactures its own weapons. The reason is that the equipment is often tailored to the specific requirement of the manufacturer, and buying it off the shelf makes its sub-optimal in another setting. Remarkably all this is despite the fact that the current operational directive to the armed forces from its defence minister is that they must be prepared for a collusive threat from China and Pakistan. To go by the Parliamentary Committee report, the three Services are clearly unprepared for a conflict with Pakistan, leave alone China. The solutions to the problems that our armed forces face are obvious to everyone. First and foremost, they require deep reform in their higher management to ensure that the ministry of defence and the higher headquarters of the three Services work as one team. To deal with the problems of defence organisation and policy, the political heads, viz the ministers and the Cabinet Committee on security require two streams of advice – from the uniformed personnel and from the civil service. Unfortunately, while expert military advice is available, all they get from the non-expert civilian bureaucracy is red tape. Unable to come up with expertise, the civilians instead take recourse to procedural obstacles to establish their supremacy over the three Services. This has made the procurement policy non-functional, leaving all three Services behind in their modernisation plans by at least a decade and a half.